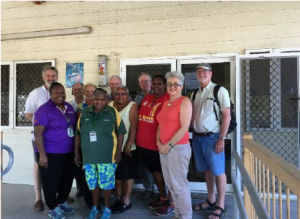 A number of College Presidents travelled to Thursday Island in the Torres Strait over a long weekend in early September with the aim of exploring issues associated with remote medicine and service delivery. With a total land mass of nine square kilometres, and a total population of 2,600 Thursday Island is small. 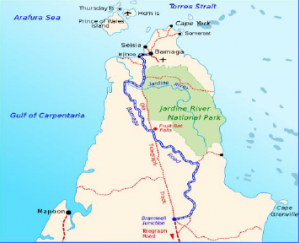 It is approximately forty kilometres north of Cape York Peninsula. The closeness between Thursday Island and Papua New Guinea as shown in the map above, clearly plays an important part in the culture, health and societal structure. The nearest populated island to PNG is Saibai island which is within the Torres Strait, part of Queensland and is four kilometres away. According to locals it is about a fifteen minute tinny ride between them. growing tourism industry. There is a hospital, courts, a centre for higher education, research stations, and local, state and federal government agencies are located on the Island. Associate Professor Ruth Stewart, President of the Australian College of Rural and Remote Medicine hosted the group and was accompanied on the various activities by Council Chair Professor Nick Talley, Mr John Batten President, Royal Australasian College of Surgeons, Professor Michael Harrison, President Royal College of Pathologists of Australasia, Professor Charlie Corke, President, College of Intensive Care Medicine, Dr Rod Mitchell, Vice-President, Australia and New Zealand College of Anaesthetists. 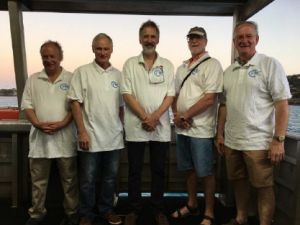 Upon arrival, College Presidents took to their CPMC polo shirts for a tour of the WWII history of Horn Island. The significance of Horn Island in military history is it was the second most attacked location next to Darwin. Tour leader Vanessa Seekee is the sole curator of the museums artefacts and has compiled much of the information herself from researching local information. She told the group the Japanese threw down over 500 bombs, their submarines sank ships in the area and their planes flew reconnaissance overhead. Horn Island was never invaded. Many veterans visit Horn Island as do their relatives and the museum is a good start to connecting with the local community, in a remote area of Australia. Afterwards, College Presidents and friends visited Ngurupai (Horn Island) Primary Health Centre. The population of Horn Island is approx 540 people – 60% identify as Aboriginal and/or Torres Strait Islander. The Centre is nurse-led 24/7 with a doctor visiting weekly from TI. 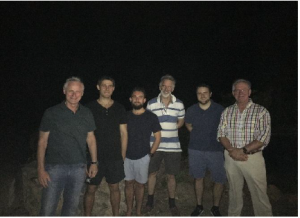 From Horn Island the group took to the water and headed to Thursday Island and had a look around before attending an evening meet and greet with local Torres Strait and Cape health executives & med students to discuss local health challenges. College Presidents then headed off early on Saturday morning to visit the Bamaga Hospital. Bamaga is located on the mainland approximately 40 kms from TI. It is accessed from Seisia jetty. The community of Seisia was established in 1947 when Sabai Island communities were devastated by abnormally high tides. Seisia was attractive as it is high dry and has a reliable fresh water supply. The Aboriginal traditional landowners granted Saibai Islanders use of the site of what is now Seisia community. Bamaga is 6km inland. The Bamaga Hospital services the communities of Bamaga, Seisia, Injinoo, Umagico and New Mapoon. 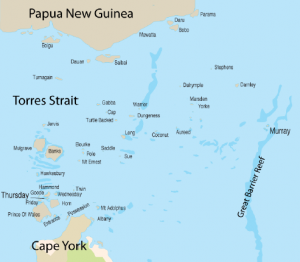 The resident population is approximately 2400 people, 95% of whom identify as Torres Strait Islander and/or Aboriginal. 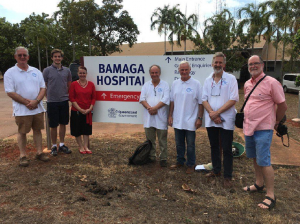 In 2014 Bamaga Hospital received accreditation plus, with the Australian College of General Practitioners Standards for General Practice. In 2015 the dental service to Bamaga Hospital increased to three days per week. Telehealth provides access to specialist services. Renal disease, obesity and diabetes are prevalent here with the self-care dialysis unit at Bamaga Hospital currently holding two chairs. services as well as child health, respiratory health, family support and quality lifestyle programs. Following this site visit College Presidents headed to the tip of Cape York Peninsula before heading back over to Thursday Island for dinner with locals. Sunday church services allowed for College Presidents to tell the locals why they were visiting. This is another important aspect of remote health care, engaging at the local level with the locals and listening. 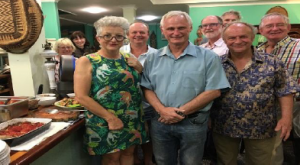 Afterwards they met with locals in the tourism and related sectors over a dinner featuring local seafood. 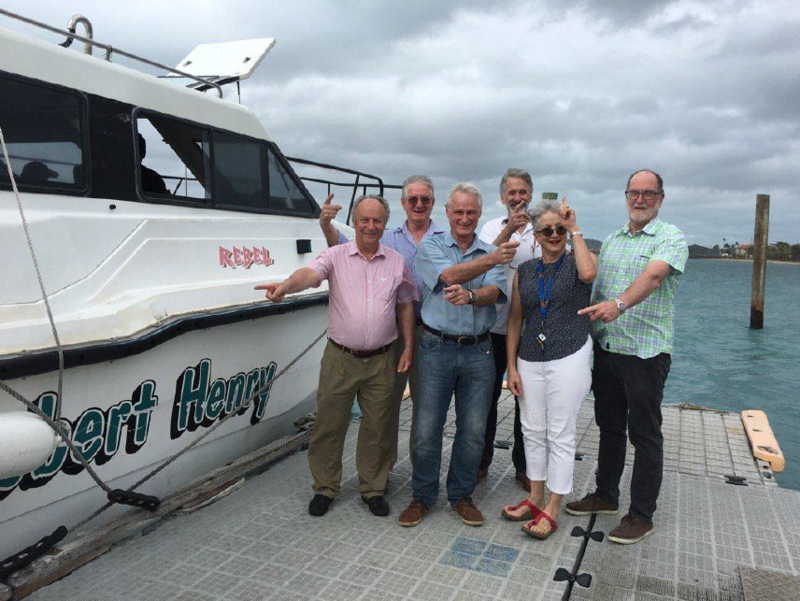 College Presidents reported the Torres Strait Island Summit as very enlightening. With a comprehensive program, including visits with locals, the forum was an immersion into remote health care from an organisation, financing and delivery perspective. College Presidents observed the challenges in organising and delivering services remotely for a complex range of conditions, as well as in planning workforce. There are cultural competency and safety aspects intimately intertwined with health service coverage. 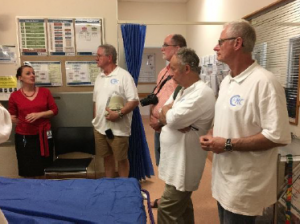 College Presidents were impressed with the facilities they visited with respect to capacity and equipment, particularly the IT telemedicine facilities available and the clearly defined network of support for rural doctors during acute, time critical presentations. The nursing staff in these areas have a broader scope of practice and a larger presence in the local communities. A key observation was for more advocacy in facilitating upskilling opportunities for doctors who work in remote areas, for example undertaking such training in metropolitan centres and the SRSA program was cited as going somewhere to fill that need. The doctors also need a network of support with a greater understanding of the remote location, transport difficulties and local medical capacity, relief periods for remote doctors, improved medical legal understanding of time critical presentations in remote locations and advocate for the maximum IT support that is possible. College Presidents also noted there is merit in promoting rural generalism, and to support the training of doctors in the extended scope that is required to face the challenges of these rural and remote location practices. Overall the summit was very revealing and College Presidents indicated it gave an insight that would not have been possible otherwise. Goodbye which way is CPMC?